Talk about inspiring—leaving a job (and pension) just three years before retirement because you see a need for change. That’s the story of Dirk and Nanja Struck, whose dedication to sustainable living set them on a different path 20 years ago, one that helps Calgarians live in a more environmentally-friendly way. The Barrelman is a small family business that produces rain barrels from food grade barrels that are rescued from the waste stream. It started when Dirk worked in commercial bakeries and saw the ingredient-barrels headed for the landfill. Feeling there was a better way, and with just a few barrels and designs, Dirk teamed with the local non-profit Green Calgary. The business has been a growing enterprise ever since. Over the years, Dirk and wife Nanja have helped more than 25,000 Calgarians harvest rain water for use on lawns and gardens: that’s an estimated one billion litres of water saved from the municipally-treated water supply. 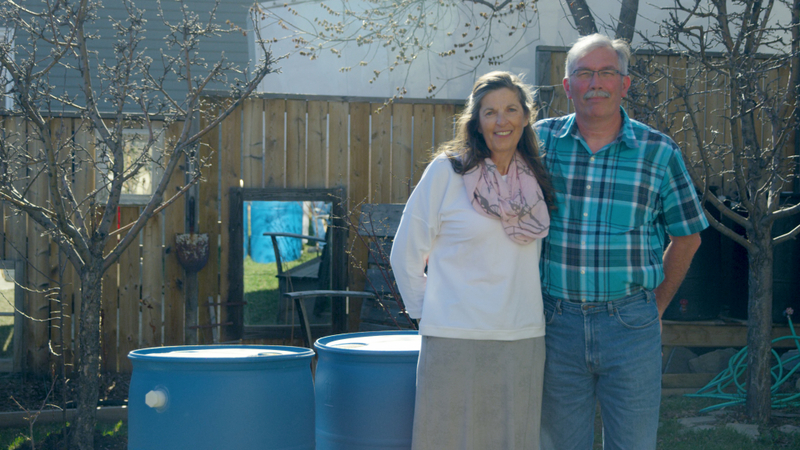 The Strucks have hand-built and delivered over 3,000 rain barrels a year to Albertans across Calgary, and in Airdrie, Okotoks, High River, Innisfail, Whitecourt and other communities. With each barrel weighing 13 kilograms, that equals 780,000 kg of plastic waste diverted from landfills. By offering their product at a discount, the Strucks have also helped local charities raise more than $500,000 in support of environment and climate literacy programs.